This is the first of many Lovely Decorating / Organizing Tips to inspire decluttering and emphasize your own personal style. Tip #1 is a way to store all those bottles of nail polish. Do you have yours lined up on a shelf somewhere? In a bin hidden away? 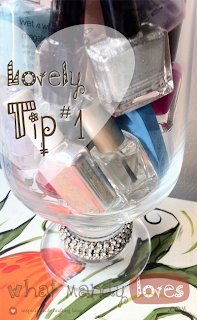 Try using a tall glass vase to hold nail polish bottles. I found this wide vase at Goodwill for less than three bucks with the intention to use it as a fish bowl. When the fish died, this glass vase seemed too large to use for flowers and would just take up space in my closet. I wanted to keep it for something useful in the future than donate it back to Goodwill. My collection of nail polish has grown from the few I had in previous years. They all fit perfectly in this oddly shaped vase, make funny clanking sounds when I try to get one out of the bottom of the vase, and look pretty cool all bundled up together instead of lined up like toy soldiers on my windowsill. It seems to bring some sophistication into the girly practice of coloring your nails. Especially the way I embellished my vase with costume jewelry. 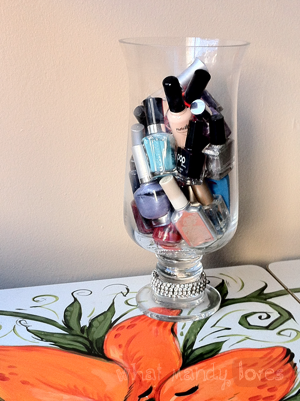 There's other ways to display your nail polish if a vase like this is hard to find. You can try party bowls, silver trays, or china plates. Do you have any other ideas for nail polish displays? Let me know in the comments!